I just solved the sequester! OK, maybe the title to this post is slightly inflated, but only slightly. A central reason we’re heading into the self-inflicted wound known as sequestration is because R’s refuse to budge on any new revenues in a deficit reduction deal to offset the $85 billion in auto-cuts about to hit our already wobbly economy. The problem, they say, is on the spending side, not the revenue side. D’s insist on balance—the solution must include both spending cuts and revenue increases, they maintain. But what if I offered you–them–a solution that scratched both of those itches at once…a way to simultaneously both cut spending and raise revenues? That would be irresistible, right? Well, I’ve got exactly that. I’m working up testimony on this for the Senate next week but the solution is so damn compelling—and the sequestration deadline only hours away—it would be downright unpatriotic to keep it to myself a second longer. Wait a minute…where’re you going? Get back here right now! I’m telling you, this should work. Let me give you a classic example of the arbitrary distinction between taxing and spending, from this awesomenew paper on tax expenditure reform by a few of my CBPP colleagues. On the spending side of the budget, the federal government provides Pell Grants to help low- and moderate-income students afford college. On the tax side of the budget, so-called 529 accounts help parents pay for college by providing tax subsidies that are most generous for upper-income households. Both of these policies are government subsidies to promote higher education; the tax/spending distinction is not meaningful here. 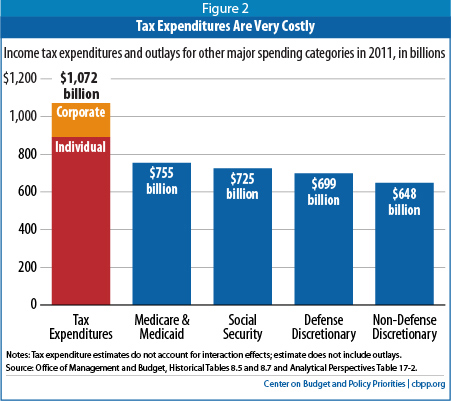 And when you sum them up, these tax expenditures are friggin’ large. The figure below shows that if they were classified as a spending category, they’d be the single biggest one in the budget. Now, just like every spending program shouldn’t be cut (one reason why the sequestration is so boneheaded), neither should every tax expenditure be reduced or repealed. So how do we decide? Well, I’ve figured that out too! We run them through JB’s Three Dimensional Tax Expenditure Evaluator, which tests each one on the basis of 1) revenue forgone, 2) efficiency, and 3) fairness. Anyone with even a passing familiarity with the tax code won’t be at all surprised how easy it is to find candidates that fail bigtime on all three. You want examples? You either have to wait for my testimony next week or page through the CBPP linked above. But by way of a hint, you’ll see carried interest, various types of deferrals, and the mortgage interest deduction in there (again, you don’t have to repeal them; the latter could usefully be transformed to a 15% credit). Better yet, you could just avoid the political morass of picking and choosing which tax expenditures to go after and simply cap deductions for high income households at 28%, an idea the President has had in his budget for years (I realize that suggesting an administration idea could queer the whole deal so forget I mentioned it…). The larger point is that once you accept that tax expenditures are spending through the tax code, you’re done. You should have sign-on from both D’s (new revs) and R’s (new cuts). It’s bye-bye sequester and hello ticker tape parade for me down Constitution Ave. See you there!